NOTE: THIS BOOK IS INTENDED FOR EDUCATIONAL PURPOSES ONLY TO SHOW THE MEDICAL PRACTICES OF THE MID-NINETEENTH CENTURY AND IS NOT INTENDED TO BE USED AS A RECOMMENDATION FOR MEDICAL TREATMENT. SOME OF THE PRACTICES RECOMMENDED IN THIS BOOK HAVE BEEN FOUND TO BE HARMFUL INSTEAD OF CURATIVE. Originally printed in 1861. 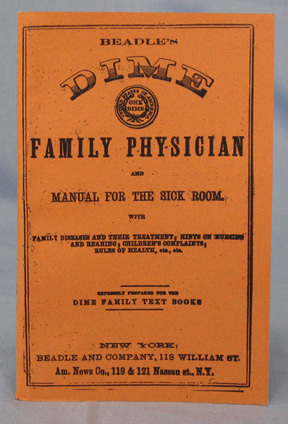 Most of the treatments contained in this book are for illnesses with only a short discussion of treatment for accidents. The diseases are grouped by category, e.g., diseases of the skin, although some of the names of ailments will be unknown to modern readers. It contains treatment for about 90 diseases. Also interesting to note is that under the ailment of "Painter's Colic," the effects of lead poisoning were already recognized. The last two discussions are of particular interest to mothers of the time period in that they address management of the sick room and diseases of children.